Potatoshare iTunes Photo Recovery 5 Completely recover iPhone/iPad/iPod photos and videos from iTunes backup files. Deleted photos of camera roll from iPhone/iPad by mistake? Lost all pictures when failed to jailbreak or upgrade iOS upgrade update? How to regain the important photos and media data when the iPhone/iPad or other iOS device is lost or broken? 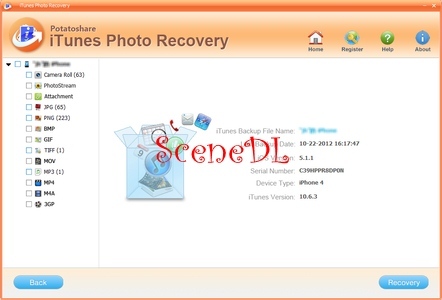 You may fall into trouble about how can I recover the deleted photos and songs from my iPhone/iPad/iPod, now Potatoshare iTunes Photo Recovery - which is known as an advanced iPhone data recovery, makes it easier than ever to rescue lost photos of camera roll, pictures of message attachment, voice memos, mp4, mov, mpeg, mp3, etc.